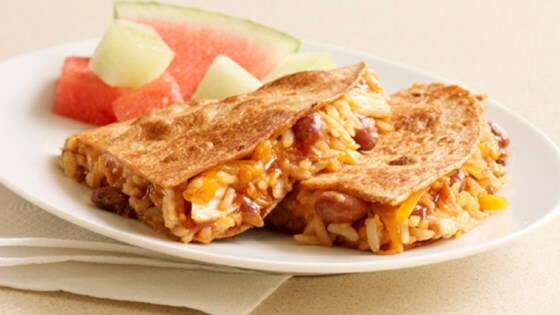 "This recipe has everything that makes quesadillas a Tex-Mex favorite, plus the goodness of UNCLE BEN'S® Whole Grain Brown Rice." In a large saute pan heat chicken and beans with BBQ sauce. When rice is cooked, add to chicken and bean mixture. Mix well and add more barbecue sauce if desired. Assemble quesadillas by sprinkling Cheddar cheese onto 3 tortillas. Top cheese with chicken mixture. Spread out evenly and finish each with additional cheddar cheese. Top each quesadilla with another tortilla. Set aside. Toast quesadillas one at a time in a large non-stick pan over medium heat. Cook until tortillas are browned on both sides and cheese has melted, being careful when flipping. Serve one half quesadilla per person. I used shredded chicken and used two cups of rice and these were delicious!! Made lots of food and was pretty good. Goes well with hot sauce! This recipe is really good. I really liked the rice in the quesadillas, it added enough substance to make this quesadilla dinner instead of just a snack. I was left feeling full and satisfied!